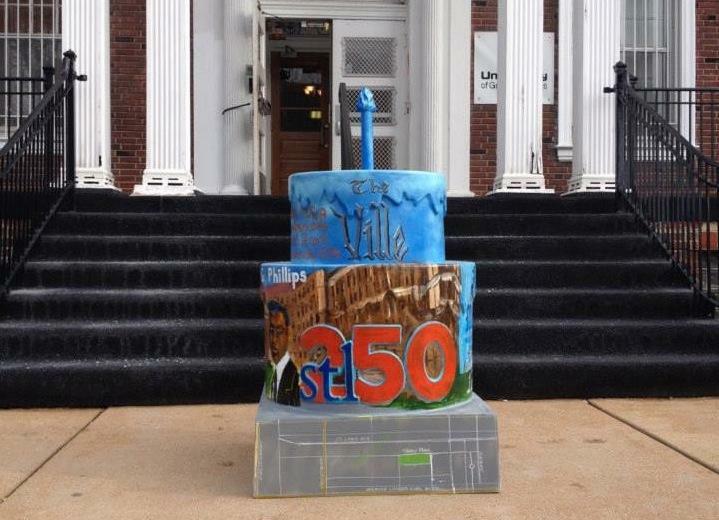 One of stl250's cakes is at the Annie Malone Children and Family Service Center in St. Louis. She was intrigued, and decided to hunt down some of the cakes. “I thought that this would be a great way to get to know the St. Louis area better,” she said. That was in May. Two months later, she has visited and photographed all 251 cakes. That’s right, there are 251 cakes. “After the list was complete, a cake showed up at the casino in St. Charles,” Page said. A "Cityscape" conversation with Amy Page of New Baden, Ill., about her quest to find all of the 251 cakes scattered throughout the region. Getting all 251 cakes wasn’t always easy. The sculptures are spread out from Troy, Mo., to Sullivan; Jerseyville to Waterloo. Most are outdoors, but a few are inside, which requires a little more planning. Page hit a personal best by tracking down 54 cakes in one day. On other trips, various family members, including her daughters, ages 5 and 2, have accompanied Page on her cake hunts. She has photographed each one. “When I started out, I mostly was taking pictures of the cake,” Page said. “Then, as the process when on, I realized I did want to see more of the location. So some of my later cake photos, I did a better job capturing things around the cake. The cakes have been moved into place throughout the year; the last cake was placed on July 22. Page had a photo of that cake by 8:39 that morning. “I see them as pieces of art,” Page said of the sculptures. She’s not the only one tracking them down, either. Facebook groups have popped up to help members track down the cakes. One of those groups sponsored a cake hunters picnic at Blackburn Park. Page said she’s run across some of those picnickers at other cake locations, and when she photographed the last cake, several of those same people were there. “It’s been nice getting to know them,” she said. Page, who lives in New Baden, Ill., said she didn’t track how many miles she drove, or how much she spent on fuel. “I didn’t want to know,” she said. In addition to getting to know the St. Louis area better, Page also has found new must-stop destinations. Page is creating an album with her cake photos and other Cakeway to the West memorabilia, including a medal and T-shirt. Use the map below (or click here for a larger or mobile-friendly version) to find out which cake is closest to you, or explore different categories of cakes. Each dot represents a cake sculpture. The shape created by the black lines represents the area that is closer to that cake than any other cake sculpture. Click on any location to find out where the nearest cake is and some information about it. Forest Park is expecting to have just under 50,000 visitors this July 4th weekend for Fair St. Louis. Officials and St. Louisans have been worried about crowds, parking and congestion. 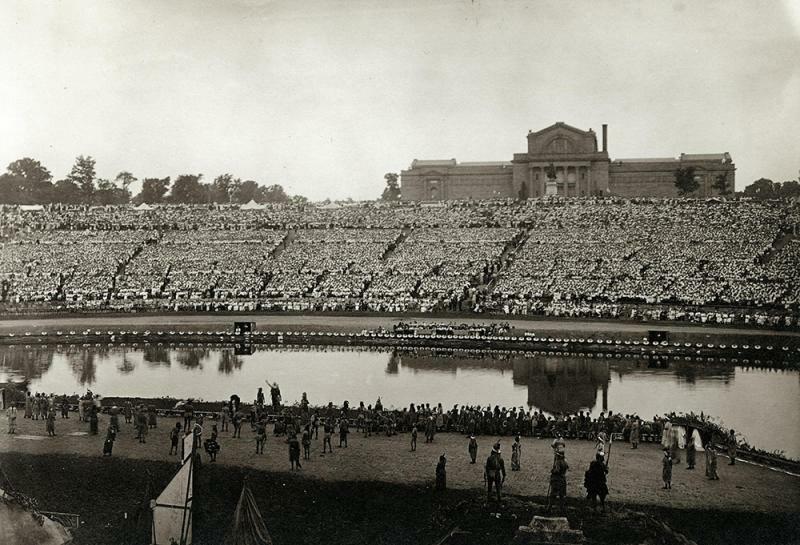 But 100 years ago, the park saw much bigger crowds for the city's 150th birthday celebration. Perhaps the planners of Fair St. Louis can learn a lot from the Pageant and Masque St.